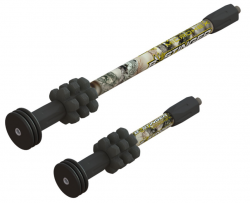 AMERICAN FORK, Utah – Bee Stinger, the archery-industry leader in stabilizers and related equipment, announces the new MicroHex stabilizer with Countervail technology. Bee Stinger MicroHex is a wind-slicing, micro-diameter stabilizer that is the first and only stabilizer to use cutting-edge Countervail material. Under a partnership agreement, Bee Stinger will have exclusive rights within the stabilizer industry to Materials Sciences Corporation’s proprietary composite – Countervail. This material, used in the high-performance realm of professional sports, is a vibration-canceling technology that significantly improves performance without compromising the structure. Read more….